Homeless resident Brian Whitten addresses a crowd gathered to discuss solutions to homelessness Wednesday at the La Plata County Fairgrounds. Participants split into groups to discuss topics such as hunger and criminalizing homelessness. The event was hosted by the American Civil Liberties Union and the National Law Center on Homelessness and Poverty. Housing is the answer to homelessness, not laws criminalizing it. 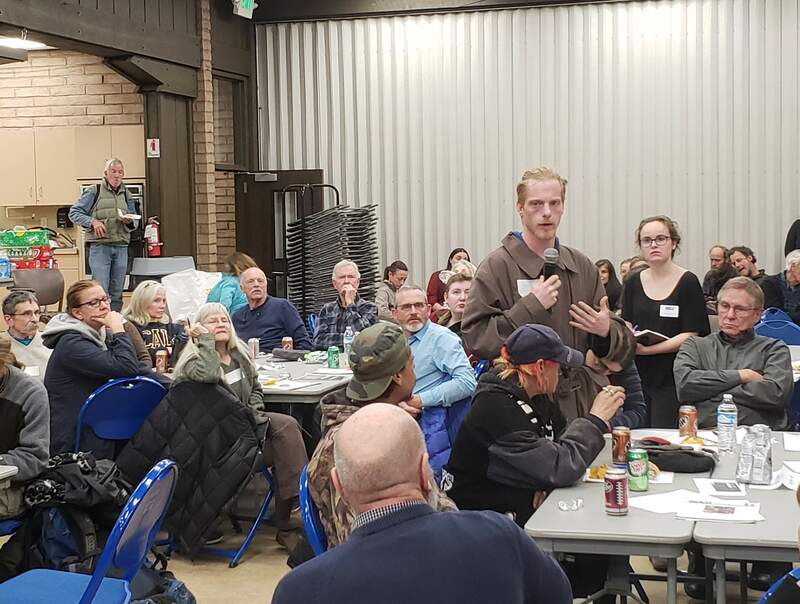 That was the message Tristia Bauman, staff attorney for the National Law Center on Homelessness and Poverty, delivered to more than 100 people gathered to discuss homelessness Wednesday night at the La Plata County Fairgrounds. “Rather than worsen the problem, we should pursue solutions that work,” she said. 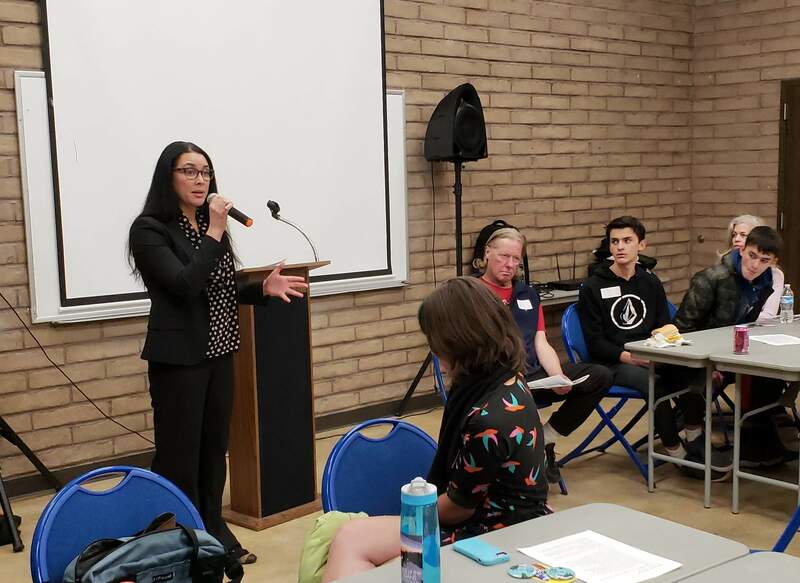 Bauman spoke at an event called “Conversation on Homelessness in Durango: Charting a More Compassionate Course,” hosted by the American Civil Liberties Union of Colorado and the National Law Center. Laws prohibiting camping, living in cars and sleeping outside have proliferated across the country, but they are expensive to enforce and ineffective when it comes to solving the underlying problem, she said. “It misdirects police resources at a social justice crisis,” she said. In Durango, the city’s no-camping ban was consistently used to ask those sleeping under a blanket or in a sleeping bag to move on, according to a white paper released at the event by the ACLU and the National Law Center. The groups found that from August 2017 to July 2018, Durango police issued 98 citations for illegal camping. Three of the citations were issued to individuals taking cover beneath a tarp or in a tent, according to the paper. People sleeping on the ground without any cover received 32 citations, those sleeping under a blanket or in a sleeping bag received 45 citations and individuals sleeping in their vehicles were issued 18 citations, according to the paper. Tristia Bauman, staff attorney for the National Law Center on Homelessness and Poverty, speaks to a group gathered to discuss homelessness Wednesday at the La Plata County Fairgrounds. About 100 people attended to discuss solutions to the problem. This fall, after receiving a letter from the ACLU, the city stopped issuing citations to people who camp overnight in public open spaces, excluding parks and sidewalks. The letter informed the city of the 9th U.S. Circuit Court of Appeals ruling that said prosecuting homeless people for sleeping on public property when there is no shelter available violates the Constitution’s ban on cruel and unusual punishment. In the long term, the city should consider its past camping enforcement and “chart a new, more effective and inclusive course,” the white paper said. Bauman also encouraged residents to seek long-term solutions. Everyone shares in the blame for creating the systems that allow residents to fall through the social safety nets, she said. But often, homeless residents are blamed for their condition, even though they may be working or have a disability that prevents them from working. She encouraged the crowd to get to know the homeless residents in the community. “Stop imagining a hypothetical homeless person who is created with the stereotypes informing your imagination,” she said. After Bauman’s address, residents split into groups to discuss solutions to hunger, criminalizing homelessness, housing, community, and mental health and addiction. Some of the ideas suggested by the discussion groups included passing out certificates for food to those in need, identifying land where homeless residents can stay and establishing a tiny home village. Jeff Hamner, a local resident, suggested trying to meet the immediate needs for shelter because the Durango Community Shelter is full. “We need to care for our fellow brothers and sisters who are hurting,” he said. Homeless resident Brian Whitten said he hoped the event might ease some of the conflict between the homeless community, the police and other residents. “Judgment and bullying, that’s the things I want to see gone,” he said.